Make a difference saving and healing lives through the science of tissue transplantation. 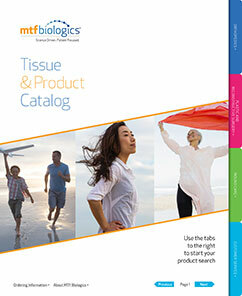 Working at MTF Biologics is a life changing experience. This is an open and supportive culture where people are valued. I feel like I’m part of a team, one that celebrates the success of it’s members. Everyday I know I’m working as a part of a larger purpose. This is an amazing place to work because my job is much more than a paycheck. I’ve been here for over 20 years. Our core values are rooted in service to others and an unwavering commitment to quality and respect for the work that we do. We have a profound impact on the lives of real families every day—and accept the challenges that come with that. I can’t see myself working anywhere else. During my 13 years with MTF Biologics, I’ve gotten to know many wonderful people who have become mentors and friends. In that time, I’ve experienced some of my most joyous moments, like becoming a father, and challenges—I was also a recipient. At MTF, you’ll have a choice—to either sit back, or get up and stand for something. How many people can say that? We are dedicated to honoring the donated gift, serving patients, and advancing science. As a best-in-class biologics company, we’re a nonprofit and physician-led.